The original sliding boxes tutorial is undoubtedly our most popular tutorial, with about 660,000 views as of this post. Given our recent surge in releasing plugins, we decided to add sliding boxes to the roster – say hello to the Mosaic jQuery plugin. Implementation is fairly easy, I’ve provided a number of sample configurations in the downloadable file on the project page. It operates with two panels – an overlay and a backdrop. The content in the overlay gets repositioned according to the options that you provide. I would suggest starting from the base.html file, as it it a stripped down version which can act as a good foundation for customizations. If you have any questions or feedback, please leave them below – it helps the plugin grow. I’ve noticed a scope issue for using mosaic on multiple versions of the same class – I will be updating this in the next 24 hours if this affects you. I’m trying to have at least 10 mosaic boxes on my website but if you rollover one boxe they all overlay, any ideas what im doing wrong..? Mike I noted this problem I will be pushing out an update shortly, thanks! I just released 1.0.1 which fixes this problem and allows you to specify the overlay and backdrop elements from within the options. I’ll be using this on my tumblr very soon..! thanks for sharing a beautiful one. Hey Sam, I absolutely love this plugin! You’re a superstar! My question is that is it possible to modify it so when I load the page the panel is already open and there is a “hide” button in the corner which makes it slide out but not completely so it can be opened again? Nice work Sam, I think you’ve just inspired me to use this on my personal site build. Really nice work! : D I did not know I was looking for a plugin like this but now can not my head stop creating ideas where I can use it. Thanks. Pretty useful script and a great looking demo. You are the man Sam! Keep it up! This is not a WordPress plugin – it’s jQuery which means you need to apply it within the scripts and markup directly. Ohhh okay thanks. Very helpful. Sorry, I’m new to this! Hello. Great job with this! This might be what my client is looking for. Is it OK if I use this so, that I get paid for implementing it into the code, but not for the plugin? If I understood the MIT license right, it should be OK, but I just want to know if you accept it :). You got it, that’s entirely allowed. Great code thanks very much for sharing it, just a quick question with regards to an earlier post. Have you released an update to fix the overlay issue when using multiple boxes with the same classes? yessir, that’s all taken care of! Just a question/suggestion. Could it be possible to make the slider/fade reacts on a mouse click instead of a rollover? I guess it’s not a big trick but for what I’m needing this plugin, I can’t use the hover action. Thanks again to share this! Hi for bar2 is it possible to make it so that when I hover over the image the overlay link looks like it is moused over and the entire box is also clickable? Note: The link that says “your content” got parsed by the comment editor. it doesnt display a second box any help would be appreciated and the rest of the plugin is great! Hi Ben — you have probably figured this out by now — but I think its because you still have the demo css code in your html file. HTH. I’ve linked my thumbnails. If i click the thumbnail and then go back in my browser (firefox) sometimes the caption stays ‘active’. In Chrome/Safari no problems… Any idea’s? anyone noticed that there is a bug on mobile safari? if you click on an item then go back the item is still in its active state for me. I noticed this as well. Any fixes? 1) Is it possible to put links in the details paragraph? I can’t, because the whole div is already nested inside an “a” tag. I would like to use the sliding in part as a menu with multiple linked items on it. 3) On the current version of Chrome on Windows, the plugin seems to have a bug when used with more than 9 boxes. From box 10 on, some will slide in, but not out again, and some won’t do anything at all. The code validates and it works fine in FF4 and IE9. 1) I sorted this by using the older (non-plugin) version of the script. It works fine with that. 2) I solved this via a counter and the classes that slide to various amounts. 3) This might be helpful for some.. Chrome *needs* a “clear:both” div when you start a new row of boxes. If you just keep on adding floating boxes inside a container div that will eventually cause a line break, the sliders further down the page (scrolling) will not work. How did you adjust how high the overlay slides up? have some suggestions for this problem? Very nice and speed on execution. Did you solve this problem? Same here. It’s really great post.Thanks for shearing it. Great tutorial and techniques well explained. I’ve been trying to merge this plugin with galleryview from http://spaceforaname.com/galleryview to get this example:http://www.forbes.com/2011/03/30/porsche-toyota-bmw-mercedes-business-autos-best-liked-cars_slide_2.html. The result I wanted is an gallery that let you browse through the images and when you hover over the image, the captions pop up. Galleryview doesn’t have ‘pop-up’ captions and I couldn’t figure out how to make the mosaic plugin work inside the gallery…. When Js is desactivated, there is only the loading animation. Images and link should at least appears. I use mosaic to launch a colorbox (http://colorpowered.com/colorbox/) gallery. When i close the gallery the .mosaic-overlay bottom property gets some value that makes both the picture and the caption go up by 50px. I have experienced this bug with explorer 7 or 8 (i don’t remember which one i’ve used) and safari 5.0.5. Firefox 4 behaves correctly. Currently i’m fixing this issue using a callback function that assigns a 0px bottom value to .mosaic-overlay when the gallery gets closed. the same here, did u manage to correct that issue? can u please explain how to do it? I don’t have that much experience in jquery so it’s getting hard these last days to figure this out.. =/ im kinda stuck here..
well, I think I solved it for me! it solved the problem of the mosaic pic and caption sliding out of the frame..!! I actually don’t know if it is important to keep that line of code intact, but as far as I can see, it works normally in FF, IE and Chrome.. and it looks that it would just trigger the callback “onClosed” if u needed something to happen after closing the colorbox, which is not the case for me.. This is an awesome jquery plugins. Love it. But i’m having one problem implementing the code. I’m using the .fade mosaic effect but when i try to duplicate it and replace with other image, the next one doesn’t work. I’ve even duplicate the div class as well. Everything works until you click on one of the images to launch a gallery. Then the entire site seems to fall to pieces. Any idea what I did wrong or where I can correct my mistake? I am assuming there is a server issue since it works on my machine. your colorbox directory is in all caps, I dont know if that was on purpose or not. Thanks, the plugin is awesome! Does the order the scripts are executed impact the overall functionality of the plugin? Is there a way to use this wonderful plugin with the Jquery Cycle all?? Is there any way to reverse the fade-in effect? I want it to be dark at first and then color upon hover. have the same question. How can we have the reverse fade effect – title fade out when mouse over. Hi guys did you managed how to reverse the effect?? I desperately need it:) THANKS! amazing helpful and useful theme, at least for me! thank you! Simply need to say the article is impressive. The clearly together with your blog submit is just simply outstanding and I can inform you’re the specialist for this niche. Effectively together with your let me to seize your feed to retain up-to-date with next posts. Many thanks 1,000,000 and kindly continue the strong do the job. I was wondering if there is a way to have multiple overlays on a single box element? It doesn’t seem to be working for me. Thanks for the help. first: thank you so much, mosaic rules! second, my question: i use “fade”. as a hover effect, i’d love to have the details show up (works) AND another image showing up in the background. is that possible, somehow?? This is fantastic – a question.. is there anyway to get multiple Divs to ALL animate at the same time when ANY of them are hovered over? can you please help me and tell me how can i add this caption feature to lightbox ? what lightbox did u use to do this? Im trying to get it to open as a lightbox once clicked but the jquery of lightboxs seems to clash with this one, and can only get one or the other working. I had the same problem as @Ian Snook the other day, I ended up going with “Advanced Thickbox” plugin for WordPress but if you are not using WordPress I believe there is a standalone version of Thickbox available. I have a problem, I’m working on wordpress website, and I’m using mosaic plugin(installed manually). Since I installed “Facebook comments for WordPress” plugin, the mosaic boxes keeps loading(with loading gif animation). Have you implimented the jquery conflict resolution? I’ve been having trouble adding the sliding boxes not loading correctly. I think your all information and your tell us about the plugin is very useful and attractive. You guys rock for making this a plugin. And just in general, you rock. Thanks for this, fortunately I found this when I need it most. First, thanks so much for sharing this plugin! It’s beautiful design! Second, I’m a noob to coding/jquery. I’m trying to use multiple “fade” boxes on one page. Unfortunately, I’m not sure what should change in the code to allow me to position each box independently. As of right now all I am managing to do is stack the boxes on top of each other, lol. Any help, or shooting me to a page that has a functioning example, would be appreciated. This is a jQuery plugin, not a WordPress plugin! 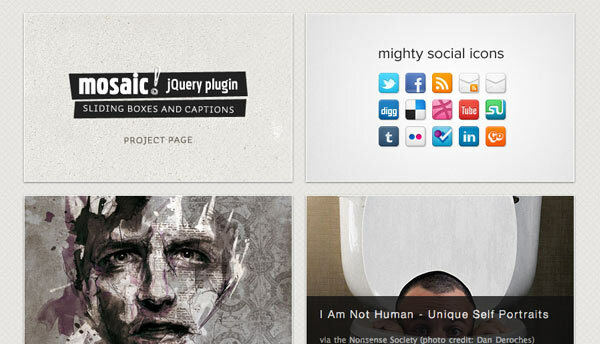 Im using both Mosaic and Supersize on my personal site (linked). Im using Mosaic as my menu and was just wondering if it was possible to make the text beneath the sliding boxes be clickable instead of the whole box being the link. Ok, I finally got it to work with my wordpress theme. I have a custom loop, so it may/may not work for you. this file is called custom-mosaic.js I only chose to load the transitions that I wanted to use. you can choose to load any one that you want to use. I was going crazy to figure this out… then again I’m not the best jQuery guy. Oh… make sure you also upload all of the native mosaic files to your theme folder. custom-mosaic.css and custom-mosaic.js are in addition to the mosaic files they do not replace them. Thanks Nate! Been struggling with this as well. Will give this a try! Did you try adding it to the header underneath the call for wp_head()? I am in the middle of creating a new theme and have successfully got it working this way. Tracy, what did you add to the header? Thanks for uploading this, it truly is amazing. The caption only pops up when you hover over the top 30px or so and not anywhere on the image. Please could you show me the part of the code where i can change this to please? I have had 2 nights with no sleep because of this!!! Very cool. I like the individual article boxes. Fantastic script, I love the results. One thing I’m trying to figure out is, with one image, it’s smooth as can be. When I apply to a gallery with a measly 9 images, safari brings my CPU to it’s knees. Same with Chrome, although the cover slide is still smooth and fast in Chrome (Mac). What’s odd is that it’s not just a spike in CPU when rolling over images…even if the static html page I’m using for testing is open and in the background (i.e. not the front most window) Safari eats up about 80% of my 4GB Memory. Has anyone experienced similar CPU issues? How hard would it be to on initial load of the page fire each event 1 time for each of the images. Gives a clue to users that more happens with the hover event. I’m attempting to dig through and see if I can make this happen. Very Cool! Love your work! Your post was really helpful to me and thanks for sharing. Hi Sam and thank’s for sharing that’s plugin! Using this probably i found an error on row 42. There is a repeated options param ‘base.options.options.animation’ and that generated an error if preload is activated. is known or am I doing something wrong? I’ve played around with this and it’s really nicely done. It can add alot to a page’s user interface. It strikes me that this would make an ideal Joomla! plugin (it’s coded in jQuery after all! ), any plans to pack it up for Joomla? Thanks anyway – nice work. Hey, have you managed to find a way to integrate this in joomla, if so would you mind posting the procedure here. Great plugin. Thanks for sharing! I’ve noticed one issue where if a jQuery twitter feed plugin is being used at the same time (I’ve tried several, including Sea of Clouds tweet, Tweetable, etc. ), then mosaic doesn’t work in Safari. It seems to work in IE, FF, Chrome, and Opera, though. First ->Thanks for the nice plugin. There is still one problem for the ipad. When i’m using for example the slide effect, the slide will work but will not go back of when clicking it again. It’s normal because click = onhover and onhover will stay. one solution is maybe onlick to call the function again to slide back. Don;t know the best solution for it yet. i was working om my site and i noticed something while implementing it. hi, i’m having same problem. did you ever find a fix to this? i had the same problem. for me, the issue was that i didn’t realize the difference in the DOCTYPE… i was using strict, and this code was using transitional. It’s been awhile since this post, but for others curious about this I simply downloaded and replaced my copy of mosaic.js with the version on this site (even though mine version said it was the latest) and it started working. i think i did not change the css so do you mean i should? Ive just been trying to to use this plugin on a site im working one. Ive managed to set up everything correctly and it works fine on its own. I also want to implement the shadowbox jquery plugin in conjunction with mosaic. This is where Im getting problems. I cant seen to get the content to show up in the shadowbox. Is mosaic made to be used on its own? You are correct. On line 42, you simply need to change ‘base.options.options.animation’ to ‘base.options.animation’. This should help fix the preloading error. Hope this helps. Many kudos for this awesome plugin! Absolutely amazing. I second the duplicate ‘options’ – just remove it 1 time as “Guy” said and preloading is on. However, it will lead to a tiny little problem when the mouse cursor is hovered over the image/div while still loading. Then, the desired animation will still work but the “image” will disappear right after first fade (in Safari & FF on Mac at least). Other than that the plugin is working flawlessly with more than 20 different object on my site so far. Still under development… happy to post a link when the baby’s going online. I’m having trouble integrating separate links within the mosaic overlay. Is this possible? I’m having a bit of an issue in Internet Explorer- I am doing a simple overlay fade with the Mosaic, but in IE, it only shows for a second on hover then disappears. Would this have anything to do with me having an older version of the JQuery library(v1.4.2)? I needed to scratch an itch, so i whipped up a Rails helper plugin for your jquery plugin. It gives us Ruby on Rails developers the ability to use your plugin within the framework, and create cool looking/acting galleries. It’s just starting to come together but is useable and I’ll be adding more/better support for other options (i only used bar2 as of today). Inside “details” you can play around with additional div tags and/or inline-block elements/styles to let the links appear on the entire space of the overlay; e.g. link1 in the upper and link2 in the lower half. I’m using this with the simple fade only… not sure how it works using the other effects? I assume there’s a similar approach to achieve the same feat. Make sure no “parent” link is overlapping the “child” links (no valid HTML!!!) while maintaining the hierarchy of the mosaic classes. I am using it on my webpage http://tantalizing-tastebuds.com/being-a-vegetarian/. I have one question on customization. I would like various posts from a particular category to be shown in these boxes i.e each box has content from a particular category and it keeps showing different posts at intervals. Is this possible? and if so how can i customize it to achieve it? I do have the same problem.. when a colorbox box is loaded and that box is closed the mosaic content shifts up. click on the FLASH button in the first mosaic element, then click the “X” on the bottom right of the colorbox. Looking forward to a solution! This is a very slick and easy to use plugin. Thank you. Hey Bryan – I have a question about your implementation. When you click on a thumbnail and bring up one of the profile boxes, with the setProfile() function changing the visibility of the #profile div from none to block, it causes the profile div to become visible but it also pushes up the page so that the top of the header area is no longer visible. Was this intentional? I tried replicating what you did and ended up with the same result but in my case, I don’t want the page to scroll vertically upward, I want the header to stay completely visible. But I can’t figure out how to make it do that. Never mind – I figured out what my problem was. I made a bad design choice with a div to place a color below the footer and it was throwing off the positioning. Removed the div (may use the body tag to implement the color), and the problem goes away. Great plugin! Very slick…However, I would like to include a couple of buttons with external links in the overlay and while I can get the button to appear, adding a link to it screws the whole thing up! I assume this is to do with the whole overlay being a link. Is there a way for me to incorporate buttons etc into the overlay or do you know of another plugin that might do what I’m asking? Is there a way of changing this so it will work on iphone/ipad? Your code gives a website so many possibilities. Thank you! Question: the code works great until I put my cursor over the sliding bar. In i.e. the bar flickers and in Firefox the bar goes away but yet the text stays visible. Any clue why? I am trying to implement Mosaic in a gallery. I made a test page using the base.html as a model and everything worked fine. Then, when I copied the code into my stylesheet and pasted the HTML into my Page inside WordPress, the text started showing up behind the overlay. (To see what I mean, go here: http://mcography.com/folio/#). See how the text is showing up gray? It is set to white. This makes me think that the text is showing up behind the overlay, which doesn’t make any sense because it worked fine on my test page and I just copied the code from there. I’ve tried everything I can think of: z-index, opacity, using an image rather than a background color, etc. But nothing works. Does anyone know how I can get the text to display ontop of the overlay? I would really like it to be white (rather than the gray-transparent color it is now). I’ve spent hours trying to figure this out, so any help would be much appreciated! Answer: I had to add “!important” to the following code for there was an “a” tag background:none conflict elsewhere in my code. Just FYI, your README file in the download has an extension of .md. This should be changed to .txt. The .md extension is a MoneyDance file format and is read as such by computers that have MoneyDance installed. Megan, not sure about your text problem, but you are loading high res images as your thumbnails. This is making your page take FOREVER to load. You should make thumbnails…thumbnail size. I´m trying to get mosaic plugin works in my page loaded through ajax method. At first time the plugin works but when i load content through ajax it doesn´t work anymore. how can i do this? any suggestion? in your ajax content js file you need to add code you used on your index page for instance I added code to “hideLoading” section which was triggered after new content was loaded. this is how I load ajax content on my page, but your loading content probably won’t be same as mine although you get general idea of what you need to do. There seems to be a conflict with this plug-in and the jquery.easing.1.3.js script. Does anyone know how I can get them to work together? I need the easing script for the Coda slider I’ve implemented. Oh I was looking for it, thank you so much, gonna try this plugin.. I experience exactly the same problem. The text is showing up behind the overlay. Can anyone help? @Kris did you ever find out what was wrong I’ve got the same problem. Text is behind the semitransparent image and I can’t figure out how to correct it. Within WordPress I am also having the same problem. The text in #details appearing behind the overlay. Have you found the solution to this issue? Is there a way to make all boxes scale according to what device it’s viewed on? I’m building a menu using several mosaic boxes wrapped in a container div, and I’m having some trouble when viewing it on mobile devices. First of all, thanks for a great plugin. Very quick and easy to use. I use the plugin to dynamically add up to around 30 tiles. You’ll notice that if the mouse is over the box when the new box is added, the text remains displayed, and does not slide back down. I’m wondering if it’s posible to combine the “circle” and “bar2” to one !? And having the transparrent text bar static and the magnify-logo just showing on hover.? Is there a way to make the overlay, when hovered – cover the bg image entirely instead of just part way? For example, can you take ‘bar2’ and change it so that when you hover over it it ‘pops up’ to the top of the bg image? Can you safely but a div within an a tag? here’s what worked for me. I havent checked if this works in all browsers yet. into an entry for the plugin. Much easier to read. I’m trying to use this on the front page of my site and it looks phenomenal. Great work. The only trouble I’m having is that it won’t show up at all in IE8 or 9. It works if I save the page as an html file in chrome and open the saved page with IE, but not accessing the site directly. Any thoughts? I can’t for the life of me figure out how to do this. When I set a % width on the .mosiac-block and don’t specify a height, it does not expand to the height of the content (I assume because of overflow:hidden). But no matter the changes I’ve tried, I can’t get it to display properly as a percentage based width. Did you able to find your answer or not? I have the same problem with this plug-in. Please let me know if you could have find any answer for this problem. It’s working for me if I put it in a PHP file, but when putting the code into the WordPress HTML editor, I get this strange bug, Any idea why? can somebody help me getting this work together with quicksand (http://razorjack.net/quicksand/ ) ? hope you can understand my question. I’m having the same problem, the images won’t load. Hey Sam! Is there anyway to change the shape of the block (background picture) to a different shape, such as a circle or polygon? and the overlay to match that shape? I have implemented in my site (see website URL) mosaic plugin and it’s amazing. Wow with a simple work to implement produce a nice view! So I would tell you one problem i have. Mosaic plugin works fine in IE and Mozilla Firefox but don’t in Safari and Chrome. If you lunch Chrome / Safari and go to the website you see the last option in the menu “Galeria…” so whnen click the first time mosaic doesn’t load images, so if you click again then works. Have you any feedback something like this? Can you explain me ehat can i do? Putting CSS before to start loading JQuery mosaic. Hi, please help me to install this great plugin. Im really struggling to get this to work in WordPress, please do you have any instruction, using latest as of date today wordpress, with the twentyeleven theme, im using a child theme..
How do you change the height of the box overlay so that you can fit more text during the hover? I’m newbie and trying to learn these things any advise would be great. you have to change the ‘height’ and ‘bottom’ settings under .mosaic-overlay in the mosaic.css file for whichever animation style you are using. Hi, thank you for the plugin. sorry, I’m a bit confused: I can’t understand if it works on iPad – I’d like a sliding boxes page, were each box shows infos on mouse over and is linkable to an other page – can it be on iPad? I think base.options.options.animation is wrong. I don’t know what may be wrong. I can’t get any images to be loaded in the mosaic-backdrop div. It seems to be blocking the load of images. It’s really frustrating. Problem solved. I was messing up everything with my css stylesheets. i have different links on my page. if i start the popup-menu, always appear all pictures in a row. i only want to have the pictures from one link. is this possible? Is there a way to load image dynamically (like Tumblr) by using Ajax ? Hi there, this is a really great plugin – i have a bit of a question – I’m loading my images dynamically server side and I need to have the height of the divs driven by the height of the image (fixed width) – i.e. images of various heights with the same width and an overlay on each. Is this possible without having a seperate inline still over each div or differrent class? Hello, great work! Thank you!! I have a problem in IE8 . Could you give me a solution, please? Great plugin but I was wondering if there was any way of reversing the effect – starting with the caption and then mouseover to reveal the image? awesome idea and costumer service. It seems not to be compatible with Quicksand plugin (http://razorjack.net/quicksand/). Is there any way to disable temporarly the plugin and call it again at the end of some other animation? I’m stuck in reverso land w/ the code! The default has the caption/overlay displayed and on hover the picture shows… how do I flip ‘er around? first I want to say thanks for this awesome tool. It looks great and is easy to use. I am having an issue using it though. While it works fine on one of my pages, I want to use on a second page with three .png elements next to each other (which means three div-containers with one picture and one effect each). For some reason, however, the first picture in the row is not shown completely as soon as I place it in the mosaic block bar container. A small piece on the right of the picture is always cut off, while the other pictures next to it are shown completely. Any ideas why this is happening? I adjustet the weight tags in the .css file, but it doesn’t have any effects. Does anybody know where my mistake is? I edited the backup css file, not the right one. Great work. I am using this for a project and i will show update the link here. A great plugin! On desktopbrowsers it works beautiful and fast but after implementing everything I checked the testsite on my ipad and, offcource, the hover function is not working as it should. Is there a way to achieve the same user experience on both desktop and mobile devices? This stops the overlay being permanently visible after it’s clicked on in iOS. I have a second problem on iOS though – the overlay appears on first click but not subsequently. Any suggestions? You helping people like me to portray ourselves as rock stars! Sam, Thanks for putting this project together. Very Nice! And, thanks for sharing it. Great mosaic slide.Thank you sam. The effect can be seen here: http://steviemusic.andrewborstein.com/releases. I just want to slow down the sliding effect. I found the area to insert/modify the jquery parameters in the of the site, not the .js files. Is it possible to make the mosaic-box and overlay the same height as the image within the box? I want to use this in a fluid site, but it seems like you have to give it a pixel-height. Is there a way I can add a delay onto the slide mechanism as I don’t want it firing when people are scrolling my page and the mouse is inadvertently hovering over the selected elements. Is it somehow possible to have the possibility that the overlay won’t go away if you have a special class added to it? e.g. ‘active-thumb’? That would be very helpful since my visitors don’t leave the page. On activation, the error “The plugin does not have a valid header” pops up. anyone figure out how to integrate the jquery easing plugin? any sort of direction appreciated. Implemented this on our site at http://www.designlagoon.com. Works great on PC and Mac but when i test on ipad and iphone the overlay does not cover 100% off the viewport – about 30% is left uncovered at the bottom. Don’t think it’s a problem with this plugin – perhaps a conflict with another plugin i’m using. Other than that – thanks for a great plugin! Any advice for accomplishing this plugins features in WordPress? I have inherited a HTML design from a previous designer and am now trying to implement it with as little changes as possible into a WordPress template. Everything works great in HTML version here: http://www.bluechipproductions.ca but I am unable to accomplish this same effect in the WordPress template! Any help appreciated! Still trying to figure this out. Tried different write ups to bring this into my wordpress theme. No luck. I’m a total novice to web development. I understand that I am supposed to input some code into the functions.php, I have tried Nate’s solution but I had no progress. Can anyone please offer a simple tutorial on how to implement this into our wordpress? There is no tutorial that I know of. I discovered that my jquery was just not being called correctly for wordpress. css-tricks to the rescue (again) http://css-tricks.com/snippets/wordpress/include-jquery-in-wordpress-theme/ was all i needed to get the code to work correctly. it should be added to functions.php. Can this be made so that when i click the image it bring up a light box rather than a link? All the images on my site are sized by %. I have been able to change most of sizing to %, but for some reason. It wants the height to be sized in px. Ive tried to size it with % but it just acts like I have set the height to 0. Is there a way to change the jquery to allow me to only size the width of the image and let the height auto size proportionally? Or is there a way to size the height with %? I am pretty new to the jquery world and I cant seem to figure out what to do. Can some one out there help me? I have changed ‘hover y’ so that the box rises further (I’m using the bar 2 example style setup). This reduces the height of the overlay so that it reveals the bottom of the image, and doesn’t even fully background the text. What can I do to make the overlay height compensate for the increased protrusion? Great plugin. I wanted to use it with a Magento site and got everything set up, except the bar slider wont show up. It seems to be configured correct because the image is shown without anything on top of it. When I change something the div details shows up and the progess.gif shows. So it must be correct. Only the bar never shows up. So I don’t know if doesn’t get triggered. Still nothing happen, really appreciate some help on this. Any plans to make this responsive? Cheers, beautiful work. Are there known issues with accessing this technique in IE9? I cannot visit this tutorial page in my copy IE9. It will not load. I reinstalled IE but the same problem. text and it behaves as it should. I tried adjusting the z-index but that did not fix it. Is there a browser setting you can think of that might be causing this? How can I invert the fade effect? I want to have a image faded, and with the hover, the image appears. GREAT WORK with this plugin! Hi there, first of all, great work! Thank you for shearing this beautiful peace of code. I’m trying to implement it on WordPress. So far I’ve managed to make it work, but I have a little problem with the text in #details. For some strange reason it displays behind the black transparent image, preventing the user to reed it properly. If any of you guys could give mi a tip for what could be going on here I would be very grateful. I don’t have much experience implementing jQuery in WP. Problem with the sliding boxes script on one of my computers with IE. Ddoes not like: . Does not load the page. Any suggestions? What browser support does this have? I’m not reading endless posts to find out and I’m not testing on my own. I figured that this would be somewhere, but what do I know. The code looks good, but questionable elements make me think this isn’t 100% cross-browser. I have a solution now, but as I was cleaning my finished project I came across your saved page and just wanted to mention you should post support information… May be I missed it somewhere, who knows. Make it great. – I use a homepage with 10 icons, and sometimes when I load or reload the site, all the 10 icons using this plugin, dont load, instead appears 10 black boxes. I try to reaload page and load properly, but sometimes need to reload two times. Autoreply: this problem only affect to Chrome on Windows 8. Loading page onto IE 10 its works OK. I have disable Plugin ADBLOCK on Chrome but continue the problem. I think my Chrome need to be update. Hey tis website i got while m surfing…tis tech is realy great…whn i use tis i din get any results y tis..cn anyone help me..
do anyone help me…tis plugin works fine in my desktop browser but whn i install it on my server i did not get any result xcept background..pls help me as soon as possible..
Great plugin! Its so beautiful! Thank you! All I’m getting is the progress.gif, it’s probably something very stupid that I’ve done/haven’t done, but can anyone let me know whats the most common problem for this? you don’t need the “a” tag to span the details. been watching your developments for a while. Just a quick question, how would you go about creating the .bar2 example but with the added exception of the image being completely overlaid which would change to a darker opacity (just like the fade example) once hovered over and then the slide up box slides up but is in white? So in essence take the .fade example and .bar2 and merge into one? just before I attempt doing this myself I thought I would see if you had an easier option, thanks. first of all thank for ur hard work and i really love it. Thanks a lot, it is really quallity work you have done. It would be perfect though if it was possible to apply it to bootstrap thumbnails with responsive layout. You say that implementation is fairly easy! Well I have not got a clue as to where to start and what steps to follow…..
Do you have any step by step implementation methods or tutorials that will help someone like me implement this correctly? Hi there. Awesome plug. One question… have you ever think about change the jquery plugin not ti use an to wrap everything, but a instead??? Let me explain. We had been workin on implementing this in two different instances in a website. The first instante works smoothly in home page (thats ok). But inside there is a div with a bottle image. On hover, voila! appears the mosaic effect. BUT inside that that I ´ve mentioned is a table with prices and a title. (that´s ok even without validate). but here it comes the mess: In the UI tests we have TWO buttons, each one with different actions. Well: two a´s inside an its mad, not to say invalid. And I´m now thinking waht about using a form with two inputs inside? that would drop the a inside a issue, but the overlapping of interactions (big a wrapping two input buttons) persist. And that´s why I ask: Is it possible to change that element inside the jqueryplugin to, lets say, a div, a blockquote, or any other block element that can handle (valid) html elements inside (for example a div conteining a table, containing tr´s td´s, a´s or form elements)?? Er… autoresponse. Did try (later on, of course) changing (wrapper) for a (wrapper). apparently it works. Haven´t read all trough the documentation and tutorials maybe. If it happens to work, I will post the demo url here: Love when someone hits a wall with their code, resolves the problem and then show the solutin to others that have crashed their head on the same wall… :) Thanks again for the Mosaic plugin!. Is there a way, using the fade option, to have the overlay load initially and fade out on hover? I’ve searched considerably and done a good bit of trial and error, but haven’t gotten anywhere with it. Can you have multiple links in the rollover information? For example, I want to have a link in the top right corner and the bottom right corner when hovered and then they will link to different locations. I have 2 different sizes of images i would like to put it on, 640×210 and 210×210, and they both on the same page. How do i change the code to be able to do this? Oh and i want the images centered and it puts them to the left, how do i get them back to the center? If the plugin does not work in IE – the problem in JQuery! Try to link the different versions JQuery! Hi, great plugin! however one question, when the page loads, the area that display the boxes loads first the details div and then loads the mosaic overlay div, this is not a good thing because it should load the image first so the image is always present and then when you hover is where the details div appears, any idea how to fix this? Thanks! I can get it to work, but I’m having to add another overlay, and it’s not letting me put a link in the bottom layer. Any thoughts? How can I put text on the overlay in Drupal in “Bar with Content”? Can’t find how to make a field for this content.